Free shipping for these for Prime members or with an order of $25+. As of the time of writing there’s a limit of ten 12-packs per flavor per customer. Note however that their prices change early and often at Amazon, so it may be different by the time you read this post. 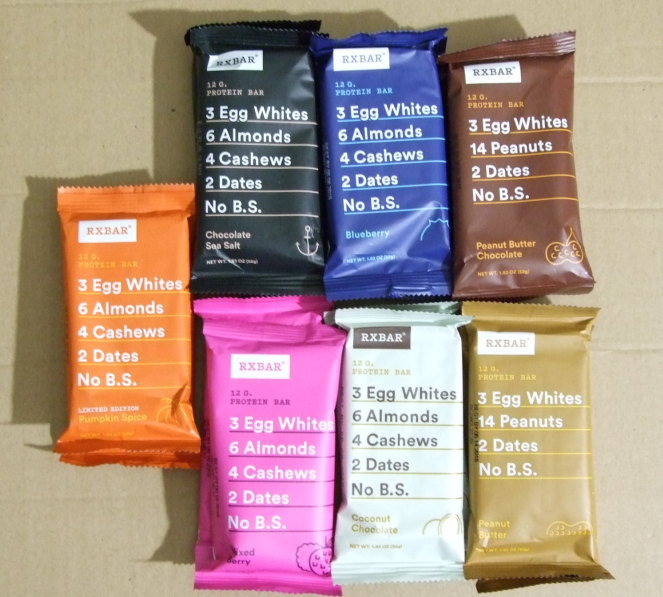 Curious about RXbars but don’t want to commit to a big order or to a single flavor? If you haven’t made a purchase at their website yet, they have a promotion for NEW customers! You can buy a 6-Bar Sampler for $6 with free shipping. There’s no coupon needed, just add the sampler six-pack to your cart and proceed to checkout. You will receive six different flavors, including my all time favorite “Chocolate Sea Salt”. 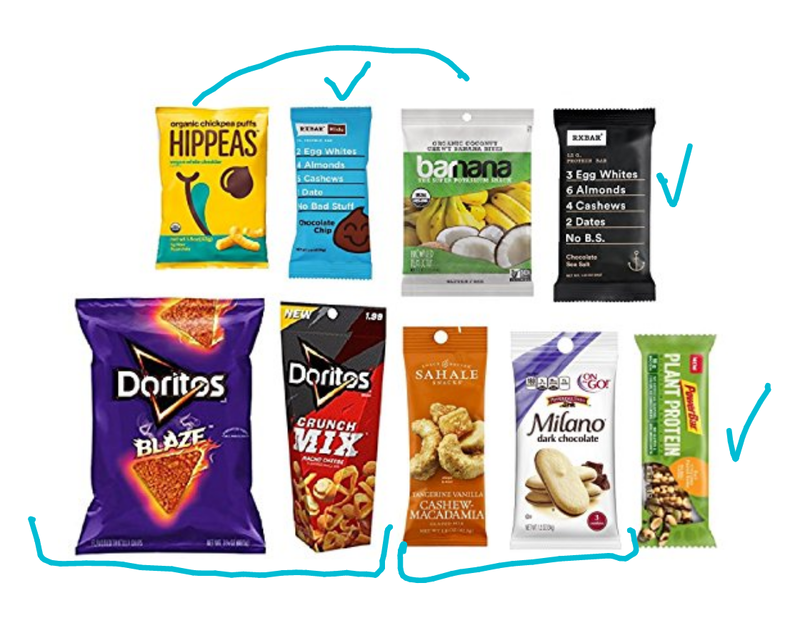 These are simple ingredient bars, with the only “offensive” ingredient being natural flavors in some of them. The rest of “real food”, dates, almonds, egg whites, etc. All of them have dates (it’s the glue that keeps them together), so if you don’t like dates or you are allergic to dates, keep that in mind! These typically go for $2+, so paying $1 per bar, and getting free shipping is a pretty good deal. Good until January 22nd at 11:59pm, the RXBar website has a 15% off site-wide sale. The sale price is factored in automatically in the shopping cart, there’s no coupon code needed to enter. Additionally, you get free shipping with orders of $20+, in other words a 12-pack or more. 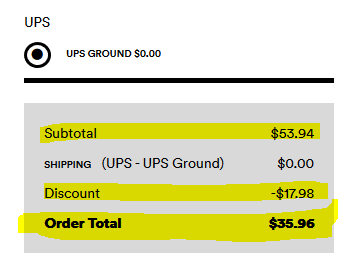 Subscriptions (similar to Amazon’s “Subscribe & Save”) are NOT eligible for the discount since they get their own discount. 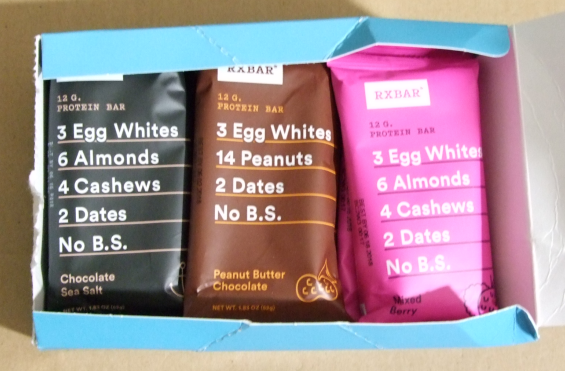 After I got tired of the Kind Bar “Strong and Kind” (the spicy and protein-boosted bars), the RXbars are now my new favorites! I scoop them up whenever there’s a sale. If you haven’t tried them before, the sell various flavors individually at Trader Joe for $2 each, so that’s a low risk way of trying them. Rxbars, another deal is here! In addition to the previously mentioned Mixed Berries, Amazon also has a sale on the Peanut Butter Chocolate 12-pack for $18. No coupon needed, no Subscribe and Save needed, but this is currently restricted to Prime members. It comes out to $1.50 per bar, which is a pretty good price for these! Limit four 12-packs per customer at this sale price. This is a relatively new flavor, thus the sale to encourage more people to give it a try. 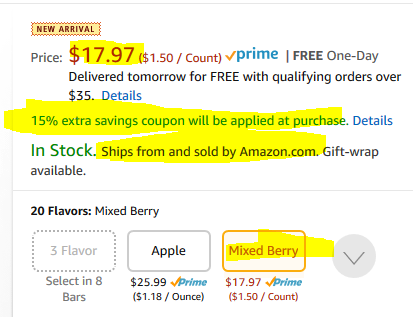 If you are a fan of the RXBars, grab your wallets and run to Amazon, where thanks to a 15% off clip-on coupon, you can get a 12-pack of RXBar Mixed Berries for $15.30 after the clip-on coupon. This is the normal purchase. The “Subscribe and Save” is about a dollar less. Both the price of the 12-pack and the coupon are running separately from each other. For example, the price of the RXbars can go up and down. The discount will be a flat 15% off on the current price, not a fixed discount. Note also that the coupon only works for items sold and shipped by Amazon actual. Marketplace sellers are not eligible for the 15% off coupon. Amazon has a brand new 15% off digitally-clip green-colored coupon on select RXbar protein bar 12-packs. Better yet, along with the coupon, the Peanut Butter flavor is discounted to $22.44 as a normal purchase or $21.32 as a subscribe and save. These prices are _before_ the 15% off coupon is factored in. So that’s a pretty good value, dropping them under $20 for the 12-pack! Use their search bar over there to check the prices of your other favorites. Remember, the clip-on coupon only works when Amazon actual is the seller, not when marketplace sellers are the sellers of record. But wait, there’s more! 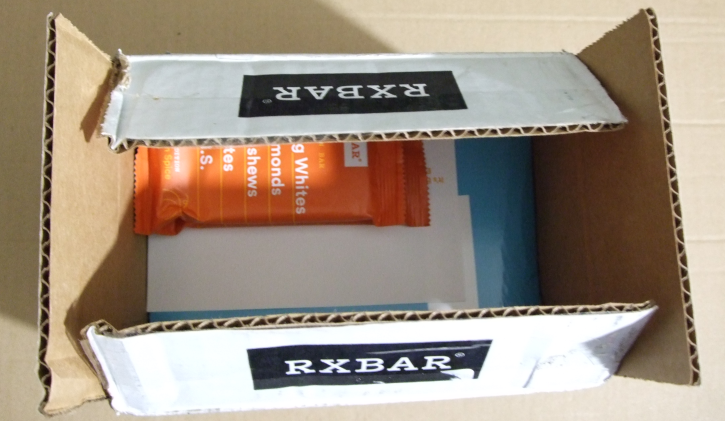 If you’ve never purchased RXbars before from the official RxBar website (Chicago Bar Company), they have a new customer coupon code that gets you 12 bars for $20 with free shipping in the six flavor sampler pack. If you are a fan of RXbars or want to try different flavors, they are currently running a pretty good “Buy Two, Get One Free” promotion on 4-packs on their website for a limited time! They offer 4-packs of various flavors for $9 each. You have to add 4-packs in multiples of three in your shopping cart to get the deal. They can be three different 4-packs or three of the same, your choice. For every two you have the in the shopping cart, the third becomes free! Free shipping is with orders of $40+ (before the discount), so you have to buy six 4-packs in order to get free shipping. That’s 24 Rxbars for $36 with free shipping. It comes out to $1.50 per bar! Since it’s food, there shouldn’t be any sales tax (unless your state sales-taxes food). There is no coupon code to enter, the shopping cart automatically adjust the prices while this offer is running! Kids trial packs are also available however note that the kids bars are almost half the weight of the standard size bars! If you are planning a Prime Pantry order soon, and you like the RX Bars, or like to try new protein bars with natural ingredients, the “Coffee Chocolate” flavor of the RXbars is on sale in the 12-pack for $21.80 through Prime Pantry. Limit three per customer during this sale. If you don’t want to pay the $6 flat shipping fee for your Pantry box, fear not, a number of items qualify for the free shipping promotion. Simply buy five items from that list and you get free shipping. It can be any combination, five units of the same item, or five different items, or three of this and two of that.